One sunny weekend, while visiting L.A., my friend’s sister joined us in Runyon Canyon Park, a popular hiking area in the hills above Los Angeles. Marta Curti works for The Peregrine Fund, an organization that works to conserve wild populations of birds of prey all over the world. And Marta has traveled all over the world. Marta’s sister, Maria and I had begun regularly hiking Runyon Canyon as it provided a serious challenge to supplement our usual Pilates and weight training routines. We had become pretty proficient at climbing those hills and believe me, it is not easy! We hoped Marta could keep up. As a child, I’d watch Mutual of Omaha’s Wild Kingdom and imagine that I was one of those mysterious experts in the field who no one knew anything about. They’d just appear; in exotic places, braving the elements, saving the endangered species of the world, living in the wild amongst the animals-or so I thought. Marta’s job, it turns out, involved much more than hanging out with Marlin Perkins and playing with big birds for the cameras of Wild Kingdom or Animal Planet. She answered some of the questions I had about her job, her lifestyle, and the physicality of her work as she blew by us on the steepest trail of the climb and for the rest of the hike! Jini-I think most people will find what you do fascinating. How did you come to get involved in this line of work? Marta- It’s a long story so, I’ll give you the short version. In college, I wanted to be a teacher. After graduation, a friend and I took a road trip across the U.S., camping and living on the road for 3 months. It affected me so much that I came back to L.A. and decided to pursue something other than teaching. I still wanted to complete my masters in education but I also applied for positions in National Parks. I had no experience for those positions so I hooked up with Americorp (similar to a domestic Peacecorp) and volunteered with them. They placed me in Arizona, New Mexico, and Alaska. Since I had a background in education, they used me as a liaison with the public dealing with environmental education. I also volunteered to work with the biologists whenever possible, where they had me doing strenuous jobs like taking notes and monitoring road kill incidents to determine the impact of roads and humanity on animals. We fed these road-killed animals to others in the captive breeding program i.e. a road-killed deer was fed to a wolf. I eventually started working for the fish and wildlife service where I heard about The Peregrine fund which worked with birds of prey. I applied, and was hired by them. Jini-Did you always know that this is what you wanted to do? Marta-No. I wanted to be a teacher but this is so much better. I get the best of both worlds as an environmental educator and I get to work directly with the animals which I love. Jini-How physically demanding is the type of work that you do? Were you given any physical training to prepare you for it? Marta- The field work that I did and still do seasonally, is very physically demanding and there is no training for it. We are sometimes hiking for 8 or more hours a day, bushwhacking through forests without trails. You slip and fall; it can be challenging. Plus, sometimes we have to bring a big bird along in order to trap it and release it in a safer area. We trap them to place transmitters on them so that we can track them in other places. This definitely gets you fit. Every volunteer that comes to work with us (with a 3 month minimum requirement) loses a lot of weight and gets very fit. Jini-Give me a typical work day for you. Marta -Up at 4 a.m. to hike out and locate the birds that we had left food out for overnight (part of the release process for birds bred in captivity.) We don’t want the birds to see us doing this. We don’t want them to associate people-with food. This is why it’s done in the dark at 4 a.m. Then we’ll hike back to the cabin and sleep a bit before going back in the field to observe these same birds in the daylight. Although we have telemetry with which to track them, it isn’t easy. Sometimes, we’ll have to go to great lengths to keep following them. This could go on all day or, if the bird is “cooperative,” we’ll be done by lunch and can relax. But occasionally, we’ve even had to rent an airplane to accomplish this. Jini-When you’re done “in the field” for the day, what do you do for fun? Marta-We go swimming in the river, playing in the waterfalls or we’ll play cards, listen to music. If we have a whole day off, we’ll go walking and observing other birds. Jini-What do you like best about your job? Jini- What do you like least? 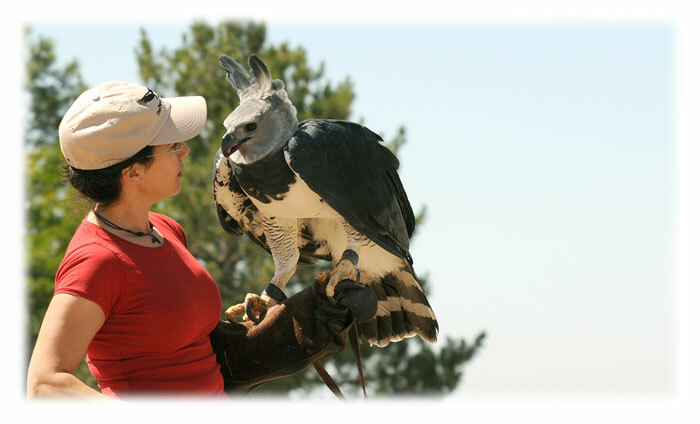 Jini-What has The Peregrine Fund been able to accomplish in terms of protecting these wild birds? Marta-The Peregrine Fund originally was created to save the Peregrine Falcon which in 1970, was an endangered species. Widespread DDT spraying had damaged falcon eggs leading to a severe shortage of offspring. By 1999, due to the efforts of the Peregrine Fund and other organizations, the Peregrine Falcon was removed from the endangered species list. Jini-If someone wanted to make a contribution to The Peregrine Fund, what would be the best way for them to do that? Marta-Go to www.peregrinefund.org and click on the “donate now” button. It’s really a very worthy cause. Fitness expert and Athletic Development Specialist Jini Cicero, CSCS, teaches intermediate exercisers how to blast through plateaus to create incredible transformations. Are you ready to take your fitness to a whole new level? Find out now! Take Jini's "Are you Ready?" Quiz at www.Jinifit.com. © 2011 Jinifit, Inc.